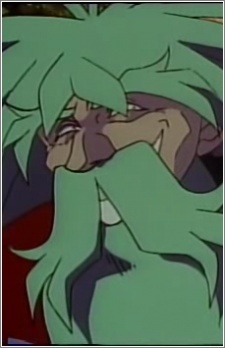 Rowdy Gabriev is an ancestor of Gourry Gabriev who lived on Mipross Island. He appears in Slayers: The Motion Picture. Lina Inverse first encounters Rowdy as an old man. After being sent back in time to save the island from the mazoku Joyrock, she meets Rowdy as a young boy. When he was young, Rowdy had a crush on the elf girl Mellyroon; however, according to Hajime Kanzaka, he would eventually grow up to marry a human woman, as Mellyroon would still be a child by that time. Although Rowdy wielded the Sword of Light, he is not the legendary Swordsman of Light of Sairaag, who might either be one of his ancestors or descendants.